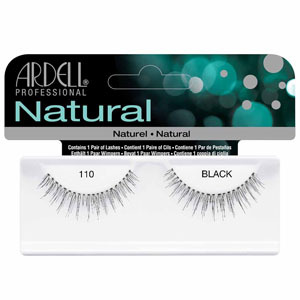 The Ardell Lashes 110 are perfectly curved with just the right amount of length and volume, with a graduated effect towards the centre of the lashes. 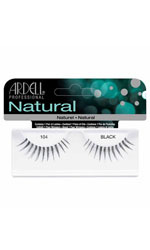 They are lightweight, reusable, easy to apply and give the desired, natural look of full, beautiful lashes. Step 1 Check Fit: Lay lash on top of your natural lash. If it extends beyond your lash line, trim the excess with small scissors. Step 2 Apply Adhesive: Squeeze a thin line of LashGrip Adhesive along the lash band. A toothpick can be used to spread it evenly. Wait about 30 seconds for adhesive to set. Step 3 Apply Lash: Place the lash as close to your natural lash line as possible. Use your fingertip to gently press along the band to secure in place.